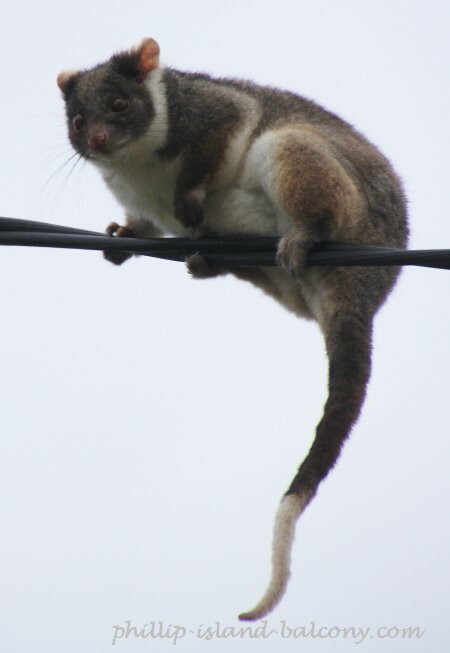 The common brush tailed possum and ring tailed possum are arboreal marsupials. They are protected in Australia. This is not so in New Zealand where they were introduced in 1840 from Australia and are now decimating forests. The common brush tailed possum has thick dark brown or grey fur, orange tummy, pointy pink nose, and long whiskers. Its prehensile black tail, with leather-like strap underneath, helps grip branches for climbing. It has very sharp claws. The brush tailed possum is the size of a domestic cat - 35 to 55cm, with a tail of 25-40cm. It can weigh up to 4.5 kilograms, with males generally larger than females. It is nocturnal and lives to about 13 years of age in the wild. The possum is very territorial and marks its territory with a secretion from a gland in its chest (as do koalas). If relocated, it generally does not survive. To communicate it makes a low throaty chattering noise. Its habitat is along the eastern coast of Australia, inhabiting forest, grassland, and scrub land where it lives in hollows in trees. Much to the chagrin of homeowners, it will also inhabit roof cavities. The brush tailed possum is a herbivore, eating eucalypt leaves but also flowers, seeds and fruits. It can decimate gardens in urban areas, where it is generally hated! Breeding can occur any time of the year but peaks in spring (September to November). 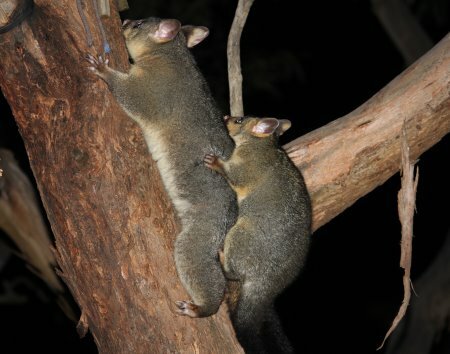 The brush tailed possum mates randomly – it does not have a life partner. The gestation period is about 17 days, with only one young. As with all marsupials, the young climbs through the mother’s fur up into her pouch and attaches to a teat. The young remains in the pouch up to nearly 6 months, and then rides on its mother’s back for up to 9 months. By this stage it is quite large. The ring tailed possum is smaller than its cousin, the brush tailed possum. Its body is 30-35cm long, with tail the same again, and it weighs between 500g to 1000g. 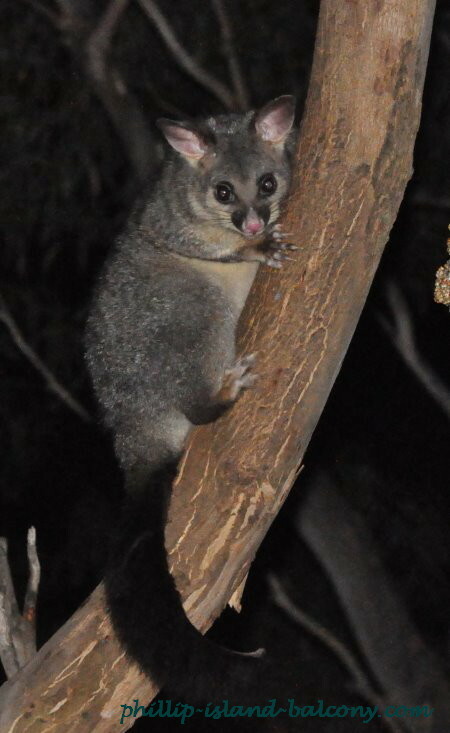 With light grey fur, white patches behind the eyes and on its tummy, and white tip on the last quarter of its thin tail, it is a very pretty marsupial. Its slightly bulging eyes are distinctive. The tail is prehensile to help it climb, and jump between branches. The ring tailed possum's range is from the top of Cape York down the eastern coast of the Australian mainland to Tasmania. Its habitat is in forests, woodlands, scrub, as well as urban areas. Nocturnal, it makes a nest, called a drey, from leaves, small branches and shredded bark, where it sleeps during the day. It can also live in tree hollows. The ring tailed possum's diet includes leaves, fruits and flowers. It will also eat its own faecal pellets to obtain maximum nutrition. Breeding is any time between April and December, with young born between May and July. Gestation is 28 days and usually two young are born. They leave the mother's pouch at around four months of age but still continue to drink their mother's milk. 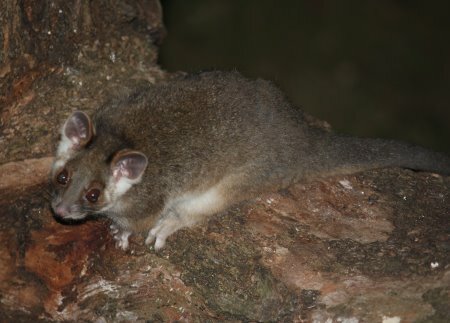 The common brush tailed and ring tailed possums are affected by deforestation. Predators include humans, dogs, the introduced fox, and goannas, plus cars and dogs in urban areas. In the northern tropical areas, they are prey for carpet snakes.